The latest superdraw jackpot is coming, with a €120 Million jackpot up for grabs on February 1st, 2019. Find out how to win with Lottoland's Millionaire lottery betting product. The new way to bet to win Superdraw is with Millionaire: Lottoland's brand new EuroMillions betting option. With the next Superdraw set to take place on the 1st of February 2019, place your bet with Lottoland for just €2 for your chance to win the €120 million top prize. Discover why you should place your bets with Lottoland's Millionaire when the next Superdraw rolls around. 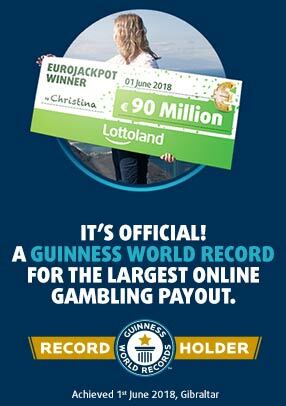 ‘Millionaire’ - the new name for Lottoland’s EuroMillions betting experience! With Millionaire, as an Irish customer, you will still be betting on the results of the official EuroMillions draw with the exact SAME (if not higher) jackpots, the exact SAME odds of winning, the exact SAME number picking format, on the exact same days (Tuesdays and Fridays). But Millionaire bets cost just €2 (saving you 20% each time) and with a huge number of additional fantastic features, such as DoubleJackpot, NumberShield, Last Minute Tickets, Magic Million and many more! If you are familiar with Euromillions then you will know how Lottoland's Millionaire lottery product works. Simply go to the Millionaire page at Lottoland to be in with a chance to bet and win. As with the Euromillions lottery you choose 5 numbers between 1 and 50 and two extra numbers between 1 and 12. The cost of a line bet is just €2 and you can win prizes which are at least as big if not bigger than the Euromillions jackpot. You can also win lower tier prizes for matching at least 2 numbers correctly.